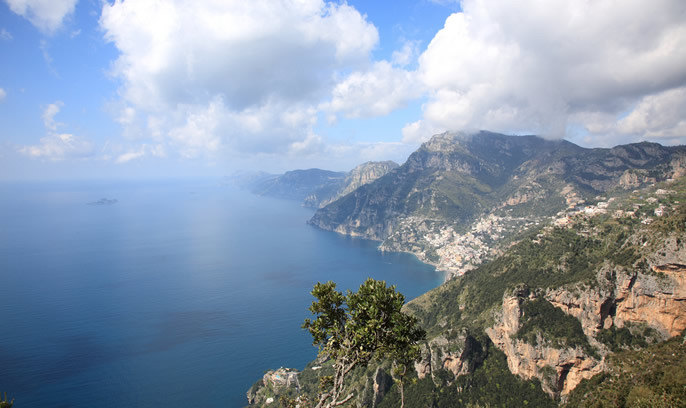 On July 16, 2010 the village of Nocelle, a small hamlet located on the Positano’s hills is going to celebrate the first centenary of the arrival of statue of the Virgin Mary in its church. For this occasion the entry community has organized a special event that will last one week till July 17, 2010.A votive candle has been lit in memory of the first centenary and the “Garments of Carmelo” were blessed and given to the faithful at the end of the Holy Mass (the tradition of the “Garments of Carmelo” in Nocelle is very rooted amongst the townspeople, particularly the women and girls who sew these garments throughout the year). On the occasion of the centenary year, Marian calendars were distributed during the Christmas season. The event will reach its moment of greatest intensity on the days of 16-17 July with musical performances, traditional lights and stands that will make happy children and adults. The community of Nocelle invites everyone to take part of this historic event wishing to spend a great time together in honor of the Virgin Mary. After the restoration done during in recent months, the venerated statue of the Madonna will arrive by sea at the Leonide Massine Quay in Positano at 6:45 p.m., after which Holy Mass will be celebrated in the Church of Santa Maria Assunta. In the afternoon and during the “Peregrinatio Mariae”, the “CITTA’ DI SORRENTO” Concert Band will perform on the streets of Positano, announcing the event and inviting everyone to join the solemn celebrations. At 6 p.m., the statue of the Holy Virgin will greet the community of Positano and be taken to the parish church of Santa Maria delle Grazie in Montepertuso, where Holy Mass will be celebrated. At 6 p.m., the statue of the Holy Virgin will be carried in a procession from the parish church to the Church of the Santa Croce in Nocelle, where Holy Mass will be celebrated on the square in front of the church. 9 a.m. Arrival of the “Città di Acquavita delle Fonti” Concert Band of Bari, directed by Giuseppe Basile, which will perform on the streets of Nocelle and on the square in front of the church. 11 a.m. SOLEMN MASS, celebrated by his H.E. Mons. Orazio Soricelli. 7:30 p.m. HOLY MASS on the square in front of the church, followed by a procession of the venerated statue of the Madonna through the streets of the town. 8:30 p.m. Live musical performance, “THE BEST YEARS”, and appearances by comic Sasà Ferrara. Throughout the days of celebration, the church will remain open so that the faithful will have an opportunity to pay homage to the venerated statue of the Madonna del Carmine. The parish priest and the Festa Committee invite everyone to take part in this historic event and hope that everyone will enjoy this holy festa in honour of Our Lady of Carmine.